The Daniel F. Breeden Eminent Scholar Chair was established in 1989 to provide support for both the academic and the outreach missions of the College of Liberal Arts. The chair is supported by an endowment from Dr. Daniel F. Breeden. Persons named to the Breeden Eminent Chair must be nationally recognized in their field with outstanding credentials in arts or humanities. They must also demonstrate potential and willingness to engage in outreach activities in the community. The Breeden Chair must also contribute a unique quality, characteristic or function to the teaching and learning objectives of the College of Liberal Arts. Dr. David Marlow is a professor of linguistics and English as a second language at the University of South Carolina Upstate. He holds a Ph.D. in English: applied linguistics, a Master of Arts in applied linguistics and teaching English to speakers of other languages, and a Master of Science in information science. He has taught ESOL in China, Japan, Nicaragua, and the United States. Dr. Marlow seeks to enhance the understanding of linguistic diversity and encourage informed approaches to speakers of non-standard dialects, both international and domestic, though education, community outreach, and academic research. Bernard LaFayette Jr. was a cofounder of the Student Nonviolent Coordinating Committee, a leader in the Nashville lunch counter sit-ins, a Freedom Rider, an associate of Dr. Martin Luther King Jr. in the Southern Christian Leadership Conference, and the national coordinator of the Poor People's Campaign. He is Distinguished Senior Scholar-in-Residence at the Candler School of Theology at Emory University in Atlanta, Georgia, and the Chair of the National Board of the Southern Christian Leadership Conference. For Spring 2018, he will teach CCEN 3200: Leadership for a Global Society: International Nonviolent Movements. Mark Hersey is an associate professor of history at Mississippi State University where he directs the Center for the History of Agriculture, Science, and the Environment of the South (CHASES). He is currently at work on a book project that explores the history of the physiographic Black Belt of Alabama and Mississippi, paying special attention to the connections between identity, land use, race, and poverty. His interest in the project was sparked by research conducted for his first book, My Work Is That Of Conservation: An Environmental Biography of George Washington Carver (2011), which resituated the work of the iconic Tuskegee scientist, placing it within America’s conservation tradition. A leading figure in the burgeoning field of southern environmental history, Hersey has authored numerous articles and book chapters and is the co-editor (with Ted Steinberg) of a forthcoming volume that offers perspectives on environmental history and its future inspired by the career of Donald Worster, one of the field’s foremost practitioners. He is currently editing a special issue of the Alabama Review that explores the environmental history of the Yellowhammer State, and is co-editing a themed issue of the History of Science that centers on the cross-pollination of environmental history and the history science. He currently serves as an editor for the University of Alabama Press’s NEXUS: New Histories of Science, Technology, the Environment, Agriculture, and Medicine series, and as a list editor for H-Rural. 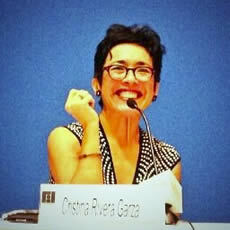 Cristina Rivera-Garza is the award-winning author of six novels, three collections of short stories, five collections of poetry and three non-fiction books. Originally written in Spanish, these works have been translated into multiple languages, including English, French, Italian, Portuguese, and Korean. The recipient of the Roger Caillois Award for Latin American Literature (Paris, 2013); as well as the Anna Seghers (Berlin, 2005), she is the only author who has won the International Sor Juana Inés de la Cruz Prize twice, in 2001 for her novel Nadie me verá llorar (translated into English by Andrew Hurley as No One Will See Me Cry ) and again in 2009 for her novel La muerte me da. She has translated, from English into Spanish, Notes on Conceptualisms by Vanessa Place and Robet Fitterman; and, from Spanish into English, "Nine Mexican Poets edited by Cristina Rivera Garza," in New American Writing 31. She is currently the Director of the MFA Program in Creative Writing at the University of California, San Diego. Los muertos indóciles. Necroescrituras y desapropiación, her most recent book of criticism, comparatively explores the contemporary discussions surrounding conceptualist writing in the United States, post-exotism in France, as well as communally-based writing throughout the Americas. Rick Lowe is an artist who resides in Houston, Texas. His formal training is in the visual arts. Over the past twenty years he has worked both inside and outside of art world institutions by participating in exhibitions and developing community-based art projects. Rick's work has been exhibited at the Phoenix Art Museum; Contemporary Arts Museum, Houston; Museum of Contemporary Arts, Los Angeles; Neuberger Museum, Purchase, New York, Kwangji Bienale, Kwangji, Korea; Museum of Fine Arts, Houston; Glassell School; Indianapolis Museum of Art; the Kumamoto State Museum, Kumamoto, Japan; and the Venice Architecture Bienale. His community building projects include Project Row Houses, Houston, Texas; Watts House Project, Los Angeles, CA; Arts Plan for Rem Koolhaus designed Seattle Public Library with Jessica Cusick; Borough Project for Spoleto Festival with Suzanne Lacy, Charleston, SC; Delray Beach Cultural Loop, Delray Beach, Florida; and a project for the Seattle Art Museum in their new Olympic Sculpture Park with David Adjaye. Rick has been honored with the Rudy Bruner Award in Urban Excellence; the AIA Keystone Award; the Heinz Award in the arts and humanities; Skowhegan School of Painting and Sculpture Governors Award; Loeb Fellow at Harvard University; Skandalaris Award for Excellence in Art Architecture; USA Booth Fellowship; and the Creative Time Annenberg Prize for Art and Social Change. Read more about Rick Lowe here and here. Tom Hallock is an Associate Professor in the Department of Visual & Verbal Arts at the University of South Florida St. Petersburg. He is the author of From the Fallen Tree: Frontier Narratives, Environmental Politics and the Roots of a National Pastoral (2003, UNC Press) and co-editor of William Bartram, the Search for Nature’s Design: Selected Art, Letters and Unpublished Writings (2010, UGA Press). Hallock is a graduate of Dickinson College and holds a Ph.D. in English and American Literature from New York University. Dr. Mary Helen Brown, Associate Professor in the College of Liberal Arts Department of Communication & Journalism. Barb Bondy, Associate Professor in the College of Liberal Arts Department of Art. As part of her appointment, Bondy coordinated the first annual celebration of National Arts & Humanities Month at Auburn University. Dr. Howard Goldstein, Associate Professorin the College of Liberal Arts Department of Music. As part of his appointment, Dr. Goldstein coordinated performances, classroom instruction, and outreach activities for the Tasman String Quartet.